There are many Ultrabook on market, but they are bulky and inconvenient to carry. We have successfully launched a laptop with the features of lightweight and ultra-thin, it can be put into a handbag or pocket, we named it Pocket. It is very suitable for light office or mobile office crowds, users give wide acclaim. And this year, we launch its second generation product – GPD Pocket 2. GPD Pocket 2 weights only 465g with the size of 181*113*8-14mm, small enough to put into your pocket and carry it anywhere anytime just like a mobile phone. 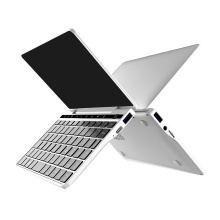 GPD Pocket 2 uses the same Intel Core m3-7y30 processor as for the new Surface Pro. With 14nm fabrication, ultra-low voltage, low power consumption, 99.76MHz bus speed, 4GT/s OPI. With 7.0 Inches IPS Full HD Screen Display, 1920 * 1200 resolution, you can directly touch the screen to operate GPD Pocket 2 just like a tablet PC. 323PPI brings richer colors and fineness to picture. 2.4G / 5G dual band WiFi supporting 802.11a/ac/b/g/n provides reliable network access with high data rates. BT4.1 enables to wirelessly transfer media files between the computer and your BT-enabled smart phone, or pair with BT wireless accessories. The biggest advantage of the GPD Pocket 2 is its active cooling design. With its fan based PC-level cooling solution, GPD Pocket 2 provides great performance.